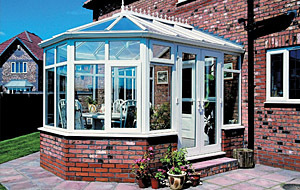 The Victorian is the most popular conservatory design and can be adapted to suit almost any property. The Victorian self build conservatory kit is still one of the most popular DIY conservatory styles in demand in the UK due to the fact that there is so much Victorian architecture in use and the design replicates architectural features such as the bay window. A note when deciding what size your new conservatory is going to be. Depending on the placement of the French doors, you will generally have two sides to position furniture, the straight wall adjacent to the house wall and the three facet front. Make sure your conservatory suite will fit into this space by drawing the internal floor plan to scale and then fitting the scaled version of the furniture onto the plan. The standard Victorian DIY conservatory kit is supplied with equal facets on the frontage. The frames on top of the facet walls are connected using 135 degree corner posts. These posts slide into the frames from the top using the patented 'Kwik Konnect' system so you don't need to use screws when connecting frames. The frames arrive fully glazed which removes the difficult job of 'packing' out the sealed units and then hammering in the beading to secure the glazing into the frame. That is what we use experienced fitters for. The DIY kit is supplied with everything you need to complete the installation. e.g. :flashing tape, all sealants and fixings, rainwater goods and a installation manual and video to make sure your DIY conservatory project is as seamless as possible.